Functional brain imaging promised to lift the lid on the black box. Psychologists responded in earnest, prodding the brain and watching which areas light up and which stay dark. But what if the brain’s most important functions are intrinsic, only occurring when we’re ‘at rest’? The recent discovery of an energy-guzzling default mode network (DMN) that ramps up several gears when we disengage from the outside world has rendered such a scenario plausible, perhaps probable. Physics had to come to terms with the fact that most of what the universe is made of is as yet virtually unstudied and unknown. Perhaps resting brain activity, and the mind-wandering it gives rise to, is psychology’s very own dark matter. The question looks set to divide the brain sciences. Neuroscientists are heralding the dawn of a paradigm shift while leading psychologists remain sceptical. Evidence that the brain remains active when we disengage from the outside world can be traced back at least as far as the 1950s to a paper by Louis Sokoloff and Seymour Kety. The pair used a classic technique involving nitrous oxide to show that, metabolically speaking, students’ brains were just as active when at ‘rest’ as during a mental arithmetic task. Raichle says the implication that there was this brain system that flickered to life when we disengage from external tasks met with immediate resistance from the psychological community. He believes this is in part because of the dominant view in the 80s and 90s, and to some extent today also, that to study brain function you present a stimulus or you ask subjects to do something. ‘There was this mindset that you’re turning the brain on,’ he says. Raichle himself has proposed that one of the key functions subserved by the default mode network may well be mind-wandering, and especially thinking about the future. He refers to a case study, first documented by Antonio Damasio, in which a stroke patient, with damage to a part of the DMN, recovered and described her experience as being unable to have any thoughts – almost as if her ability to mind-wander had been lost. The possibility that the DMN may support mind-wandering was tested explicitly in 2007. Malia Mason and colleagues first asked participants to report how often their minds wandered during either highly practised or novel tasks. As you might expect, mind-wandering was more prevalent during more practised tasks. Next Mason’s team scanned the same participants under similar conditions, as they performed either novel or practised tasks. They found that the DMN was more active during the highly practised tasks and that this was particularly the case among those participants who claimed to mind-wander more. ‘Since Raichle made his claims in 2001, people had been floating around the idea that off-task thoughts and day-dreams are subserved by the DMN,’ says Smallwood. ‘But the Mason paper, and to some extent a 2003 study by Kristen McKiernan (which showed increased DMN activity during easier tasks) made a leap, in the sense they made this the focus of their investigation; before then it was just speculation. 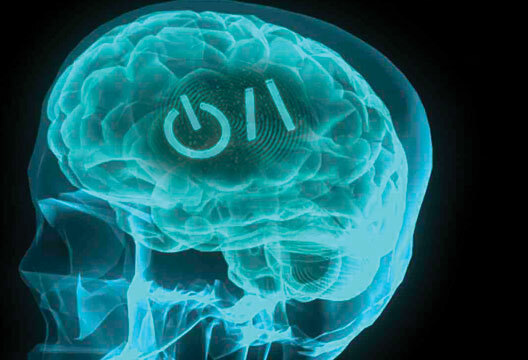 Many psychologists and neuroscientists now routinely scan the brain at rest. Here’s a sample of recent default-mode-related findings from disparate fields. Autism: In 2006 Daniel Kennedy (University of California) and colleagues reported that children with autism failed to show ‘deactivation’ in the DMN when engaged in a Stroop-like task compared with rest, whereas the deactivation was seen as usual in control participants. The researchers said the result was likely to be due to the children with autism having reduced DMN activity at rest – an anomaly they argued might play a causal role in the children’s social impairment. Depression: Could resting-state brain activity help identify patients with depression who are unlikely to respond to treatment? A brain-imaging study by Michael Greicius (Stanford University) and colleagues revealed abnormal patterns within the DMN of patients with major depression – exaggerated connectivity between a region called the subgenual cingulate, known to be involved in emotion processing, and the rest of the DMN. This was especially the case among those patients who’d been depressed for longer. Alzheimer’s disease: In another study, Greicius and colleagues found reduced resting-state activity in the hippocampus and posterior cingulate of Alzheimer’s patients compared with controls. They argued that scanning resting-state brain activity could prove to be a sensitive way of detecting the disease. Comparative studies: Chimpanzees show greater activity in the DMN during rest compared with during externally focused cognitive tasks, in a similar way to humans. James Rilling and colleagues made the observation in a 2007 study after comparing the resting brain activity of eight humans and five chimps. Species differences were also apparent. For example, the chimps showed less left-side activity, probably because they lack language. In a simple world, the story could end here: Brain network that’s more active at rest is discovered; psychologists respond by showing renewed interest in intrinsic mental activity. But the reality is a little more complicated. When Malia Mason’s 2007 paper linking the DMN with mind-wandering was published, it was accompanied by a critical commentary by psychologist Sam Gilbert at UCL and his colleagues, including cognitive neuroscience luminary Chris Frith. Gilbert and his colleagues argued that what Mason’s group had inferred was mind-wandering activity could just as plausibly be construed as enhanced watchfulness – in other words, an exaggerated focus on the outside world. Supporting this alternative view, Gilbert’s team pointed to research they’d conducted showing that in a simple reaction-time task, medial prefrontal cortex activity (a key part of the DMN) was actually higher when performance was better, consistent with the idea that this brain activity reflected increased watchfulness. What the discussions about Mason and colleagues’ paper betray is a growing unease among large quarters of the psychological community that it can ever be a good thing to focus on scanning people’s brains when they are at rest. After all, if there’s room for multiple and contrasting interpretations about the mental processes involved during a practised task (as in the Mason study) then the scope for disagreement about the possible mental activities involved ‘at rest’ must surely be even greater. Morcom and Fletcher’s paper acknowledged the potential diagnostic utility of scanning the brain at rest. But beyond that, the pair argued in detail that studying the resting brain has no use to cognitive neuroscience whatsoever. In their view there is nothing inherently special or mysterious about the ‘resting state’ of the brain. They also rejected Raichle’s claims that the DMN being ‘active’, but not ‘activated’, in the resting state means that it therefore reflects a baseline, intrinsic mode of operation. ‘When Raichle says these [DMN] regions are not “activated” at rest, although they are active, he’s making a technical point about the balance between the oxygen supply and demand in these areas and indeed the whole brain,’ Morcom explains. ‘But while there’s this balance, the level of neural activity varies widely in the DMN and across the brain. So although the blood flow balance may be special at rest, there’s no reason to think that the same is true of the neural function.’ If Morcom and Fletcher are right, this would suggest that there isn’t anything special about the brain activity observed at ‘rest’ – it doesn’t deserved to be placed in a category all of its own. In fact, by this account, the most important distinguishing feature of neural activity at rest is that no one really knows what participants are doing with their minds during this time. Technical issues aside, what everyone appears to agree on is that what the mind is doing when it’s turned in on itself is a vitally important topic for investigation. If the discovery of a postulated DMN has raised the profile of these so-called intrinsic processes, then that can only be a good thing. The points of contention, the state of play, revolves around whether scanning people at rest is the way to study these intrinsic processes, and whether the DMN, as it was originally conceived, really exists at all. However, Marcus Raichle and other DMN advocates, remain undeterred. They continue to believe that studying the brain at rest holds the key to many secrets. In fact, there is an entirely new field now in which investigators look for correlations in resting state activity between brain regions so as to create a functional map of the brain. Raichle points me to a noteworthy paper published last year in PLoS Biology, which is just the latest to take this approach. Patric Hagmann and colleagues used diffusion tensor imaging (DSI) to create beautifully intricate maps of the dense cortical pathways within the cerebral cortex of five participants, and crucially, they then used fMRI to scan the same participants at rest. ‘We found a close correspondence between the strengths of structural connections derived from DSI and functional connections derived from resting state fMRI in the same participants,’ Hagmann’s team concluded. In other words, neuroscientists like Hagmann are using the resting state as a functional template with which to inform their structural findings – exactly what psychologists like Morcom and Gilbert say they shouldn’t be doing. A typical SART task will require participants to respond to the numbers 0 to 9, but excluding the number 3. An inappropriate response to 3 acts as a marker for an attentional lapse and the period preceding an error is a strong candidate for a mind-wandering episode. Another approach is to use thought probes, which involves unexpectedly asking a participant to report what they were just thinking about – whether they were ‘on task’ or if their minds had wandered. An obvious disadvantage with this approach is that participants will soon cotton on to the purpose of the research, which is likely to have an effect on their tendency to mind-wander. Earlier this year, Smallwood and colleagues combined brain imaging with use of thought probes and measures of attentional lapses to show that default mode network regions are activated during mind-wandering episodes. In other studies they’ve looked at the links between mind-wandering and creativity and comprehension. Together with Jonathan Schooler, Smallwood is currently developing a model to explain why we sometimes catch ourselves in the act of mind-wandering and sometimes don’t. ‘One idea is that the brain needs to periodically take stock of what it’s doing,’ he says. Christoff, K., Gordon, A.M., Smallwood, J. et al. (2009). Experience sampling during fMRI reveals default network and executive system contributions to mind wandering. PNAS, 106, 8719-8724. Damasio, D. & Van Hoesen, G. (1983). Emotional disturbances associated with focal lesions of the frontal lobe. In K. Heilman & P. Satz (Eds.) Neuropsychology of human emotion (pp.85–110). New York: Guilford Press. Gilbert, S.J., Dumontheil, I., Simons, J.S. et al. (2007). Comment on ‘Wandering minds’. Science, 317, 43b. Gilbert, S.J., Williamson, I.D.M., Dumontheil, I. et al. (2007). Distinct regions of medial rostral prefrontal cortex supporting social and nonsocial functions. Social Cognitive and Affective Neuroscience, 2, 217–226. Greicius, M.D., Flores, B.H., Menon, V. et al. (2007). Resting-state functional connectivity in major depression. Biological Psychiatry, 62, 429–437. Greicius, M.D., Srivastava, G., Reiss, A.L. & Menon, V. (2004). DMN activity distinguishes Alzheimer’s from healthy aging. PNAS, 101, 4637–4642. Hagmann, P., Cammoun, L., Gigandet, X. et al. (2008). Mapping the structural core of human cerebral cortex. PLoS Biology, 6, e159. Kennedy, D.P., Redcay, E. & Courchesne, E. (2006). Failing to deactivate. PNAS, 103, 8275–8280. Mason, M.F., Norton, M.I., Van Horn, J.D. et al. (2007). Wandering minds. Science, 315, 393–395. McKiernan, K.A., Kaufman, J.N., Kucera-Thompson, J. & Binde, J.R. (2003). A parametric manipulation of factors affecting task-induced deactivation in functional neuroimaging. Journal of Cognitive Neuroscience, 15, 394–408. Morcom, A.M. & Fletcher, P.C. (2007). Does the brain have a baseline? Neuroimage, 37, 1073–1082. Raichle, M.E., Macleod, A.M., Snyder, A.Z. et al. (2001). A default mode of brain function. PNAS, 98, 676–682. Rilling, J.K., Barks, S.K., Parr, L.A. et al. (2007). A comparison of resting-state brain activity in humans and chimpanzees. PNAS, 104, 17146-17151. Shulman, G.L., Fiez, J.A., Corbetta, M. et al. (1997). Common blood flow changes across visual tasks. Journal of Cognitive Neuroscience, 9, 648–663. Smallwood, J. & Schooler, J.W. (2006). The restless mind. Psychological Bulletin, 132, 946–958. Sokoloff, L., Mangold, R., Wechsler, R. et al. (1955). The effect of mental arithmetic on cerebral circulation and metabolism. Journal of Clinical Investigation, 34, 1101–1108.